In your high school yearbook, you were probably voted "Most likely to win the Nobel prize," or "Most likely to marry a burrito." Maybe you didn't even get a superlative. But maybe, that's for the best. There are some things you just don't want to be remembered for -- like, say, being the most likely to have one too many drinks. And if you're wondering who actually is the tipsiest girl at the party (the party being the United States of America), data aggregator, 24/7 Wall Street has ranked every American city, according to their heavy drinking habits. 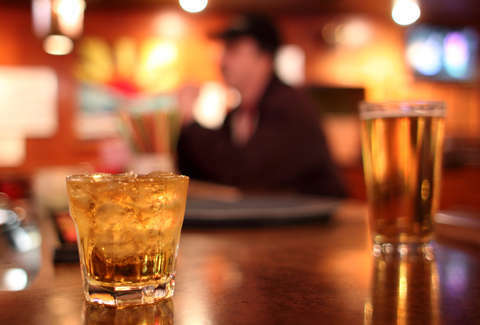 Using data collected by the Robert Wood Johnson Foundation and the University of Wisconsin Population Health Institute, researchers ranked every city based on self-reported binge-drinking statistics recorded by their own local populations. Apparently, 18% of American adults drink unhealthy amounts of alcohol on average, which isn't quite the same as drinking a lot on the weekends. According to the Centers for Disease Control & Prevention (CDC), that's four or more drinks for women and five or more drinks for men during one sitting on a daily basis. Interestingly, we're not looking at serious boozy behavior in major party cities like New York and Chicago, per the data. Instead, seven of the 10 American cities most prone to hard drinking just so happen to fall in Wisconsin. That's right, Wisconsin. This may have something to do with ice fishing (you're required to sit still, and you might just die of boredom without alcoholic beverages on hand). Or maybe folks from Wisconsin are just that much more honest. The data is self-reported, after all. Either way, here are the 20 American cities with the highest number of reported hard drinkers (tanks, if you will), all across the country. Appleton, we admire you for your honesty, and your commitment to cold beer. In fact, we salute the entire state of Wisconsin for their candor. And for those of you in Manhattan and San Francisco, know that Corvallis, Oregon can drink you under the table.